Walk the streets of Deep Ellum, and you feel it: the neighborhood is Dallas’ lungs. The ever-growing district fills the rest of the city with breath and spirit. Your eyes will dilate from crispy falafel with garlic sauce or sweat spraying on electrified amps during concerts; from 800-degree ovens blistering pizza crust and pulse-quickening coffee. Our little neighborhood, just east of Downtown and the Arts District, has experienced a roller-coaster of changes over the past decade. In the ‘90s, a boom of nightclubs and bars, tattoo parlors, and residential lofts made Deep Ellum (originally named Deep Elm, but residents pronounced it “Deep Ellum” and the name stuck) the perfect home for nightlife, booze, and music. Now, Deep Ellum is smack in the middle of a dazzling second boom. 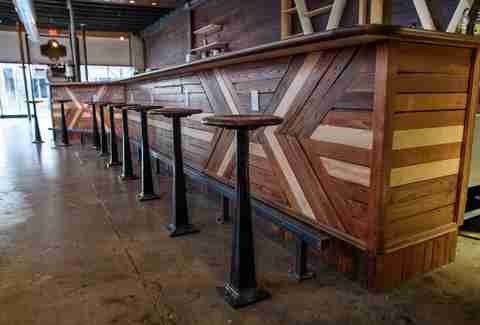 At least 20 new restaurants and bars have opened in the area in the past year. High-rise apartments are cycling up, floor by floor, with more being eyeballed. Street construction is making Main and Elm more walkable, with brand-spanking-new parking meters. It’s a living, breathing, kinetic district. It’d be easy to compare it to Brooklyn or LA or San Francisco, but Deep Ellum is an amalgam of no other city but Dallas. Side by side, the community embraces its newness alongside its icons: order handmade Taiwanese street noodles with a cold lager that was brewed down the street. Devour deviled eggs and wander into a punk show. It’s not an “eclectic” mix of food and entertainment; it’s a mirror of who Dallasites already are in 2016. The second-best block of time in these parts is happy hour, and BrainDead Brewing is the Deep Ellum Brewery you're looking for. It has bar food that will light up your head like a Christmas tree (see: charred octopus ceviche), brews its own beer, and has three-dollar specials. Their Braindead Red, an India Red Ale, is killer. On Elm St, the Armoury D.E. has head-turning cocktails like the Mr. Pink, with gin, lemon, raspberry, egg white, and absinthe. The best block of time in Deep Ellum is late. Like, after midnight. If you’re there during this golden time, head to the Black Swan Saloon, where owner-barman Gabe Sanchez will shake up the best damn cocktail you’ve had in months. His hot toddy, a warming drink pierced with orange and clove, is simple and remarkable. The shows in Deep Ellum are so strong and good, they’ll knock you down. On Fridays and Saturdays (and most Thursdays, now), it’s not uncommon to see tour buses and scuffed-up band vans parked haphazardly on Elm St, hazard lights blinking. Head to Dada for an under-15-dollar folk show or indie rock that rattles the ceiling. There are strong drinks and patio chairs which will only be more comfortable after said drinks. You don’t even need to have a calendar in front of you: check out the Free Man on Commerce for New Orleans jazz, or Reno’s Chop Shop for heavy metal. The Bomb Factory is a gem, on Canton, with upcoming shows like Animal Collective, Ghostland Observatory, and Yelawolf. 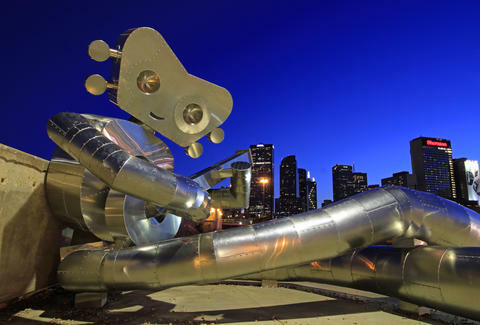 The music literally spills out in the streets in Deep Ellum; just follow that thump in your chest. Street food, whether on the street or not, is a joy in Deep Ellum. The Monkey King Noodle Company has a beef noodle soup that’s like fireworks, and dumplings that’ll ruin you on all other dumplings. They’re hand-making noodles, which you can watch through the kitchen window. Pull up to the bar at Brick & Bones (kitchen’s open very late) for how-did-they-make-chicken-so-good fried chicken. Make sure you get a foil pack of their smoky, charred green onions, which are best eaten by hand. There’s Amsterdam Falafel, where you can pack a pita with crispy, fresh, piping-hot falafel and garlic sauce. Or screw it, drop an elbow at the bar at Angry Dog, watch the game, and eat hot and crispy nachos. Don’t forget a beef rib at Pecan Lodge, too. You know, as a snack. A recent, exciting addition to Deep Ellum’s beating heart: Deep Vellum Books. One of Dallas’ few indie bookstores (founded by Deep Vellum Publishing’s Will Evans), it's where you can find independently published books covering all things art, movies, and music. At 2630 Commerce, find the world’s first eight-track museum. It’s exactly how it sounds, and it’ll put a few tears in your eye. Beforehand, you might grab a cortado and a “cheese shot” at Drugstore Cowboy. Or sit and have a breakfast sandwich and a breather at Murray Street Coffee Shop. Grab a magazine and a patio seat. There’s also Off the Record, which is -- wait for it - -a bar, music venue, and vinyl store. There’s an innovative power to the retail stores that run in Deep Ellum. 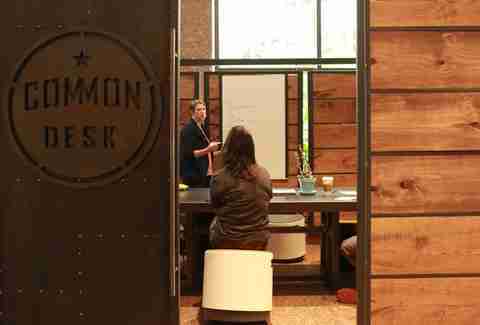 Grab a seat at Common Desk, a coworking environment for freelancers, startups, or small businesses. There’s the Akola Project on Main, a nonprofit, mission-based boutique selling jewelry and accessories crafted by women in Uganda that seeks to empower women and the community. While you’re there, stop by the Rachel Nash Gallery to check out some wall-spanning art from an SMU grad. Work out your talk-in-front-of-people kinks at the Dallas Comedy House, which hosts improv and theater classes. Stay for the show. Any list of the best restaurants in Dallas that doesn’t include a handful of meals from Deep Ellum is doing it wrong. Where do we even begin? How about On the Lamb, at 2614 Elm, for screamingly fresh and beautiful halibut or house-made tagliatelle (who does that?). Wildfire-hot Cane Rosso is one of the few true, certified, authentic pizzerias in the country. Not just Texas -- the whole United States. 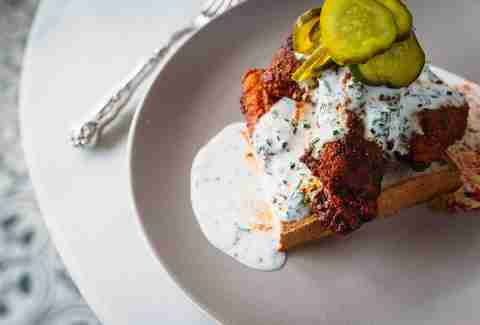 There’s Filament, where Southern-inspired cooking like fried hot catfish and lemon meringue pie is elevated to cloud-level. You’ll punch yourself in the brain if you don’t try a Chicago dog at Luscher’s or a Casablanca-good double cheeseburger. 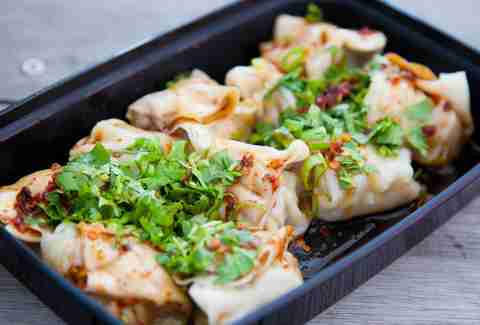 Same goes for the Hungarian-inspired sandwiches at Armoury D.E. Really, truly treat yourself afterward with a beautifully weird doughnut at Glazed Donut Works or the green tea ice cream at Deep Sushi. You gotta love a town where there’s great ice cream at the sushi spot. Nick Rallo is a writer in Dallas. His reviews on burgers appear weekly in the Dallas Observer, and he's eaten way, way too much pizza in Deep Ellum. Follow him @nickrallo.